Give your employees safe, easy access to the data and resources they need to be productive from a range of devices, including iOS, OS X, Android, Chrome OS, Kindle Fire and Windows. At the same time, ensure that the corporate network is protected from mobile security threats. 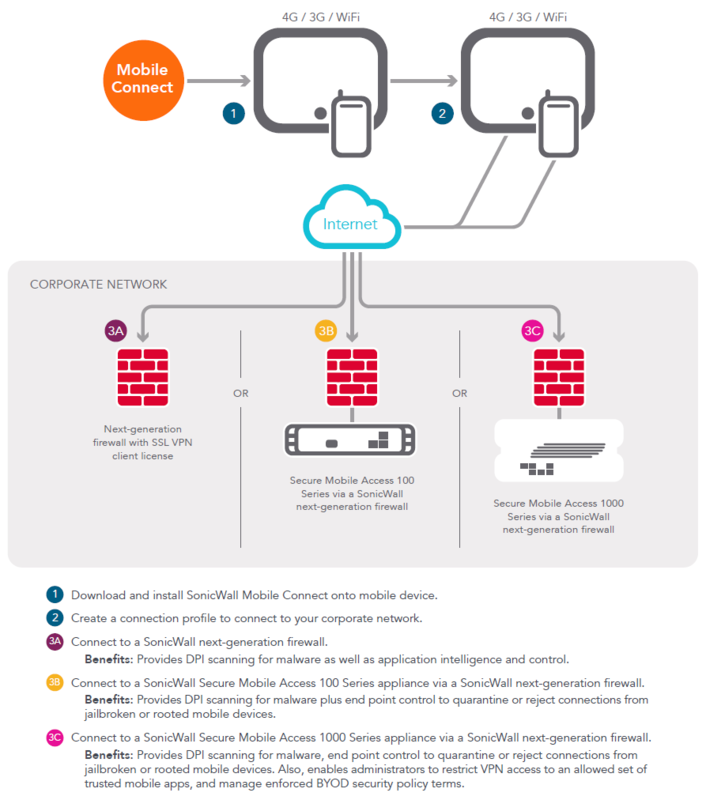 The SonicWALL Mobile Connect application works in combination with SonicWALL Secure Mobile Access (SMA) or next-generation firewall appliances. Mobile workers simply install and launch the Mobile Connect application on their iOS, OS X, Android, Chrome OS or Windows mobile device to establish a secure connection to an SMA or next-generation firewall appliance. The encrypted SSL VPN connection will protect traffic from being intercepted and keep in-flight data secure. Contextaware authentication ensures only authorised users and trusted devices are granted access. Behind the scenes, IT can easily provision and manage access policies via SonicWALL appliances through a single management interface, including restricting VPN access to a set of trusted mobile apps allowed by the administrator. Plus, the SonicWALL solution integrates easily with most back-end authentication systems, including two-factor authentication, so you can efficiently extend your preferred authentication practices to your mobile workers. iOS, OS X, Windows 10, Android, Chrome OS and Kindle users can easily download and install the Mobile Connect app via the App Store, Google Play, Chrome Web Store, Amazon App Store, or Windows Store. For Windows 8.1 mobile device users, Mobile Connect is embedded in the Windows 8.1 operating system so there is no need to download and install another VPN client app. IT can provision and manage mobile device access via SonicWALL appliances - including control of all web resources, file shares and client-server resources - through a single management interface. Unlike other VPN solutions, the SonicWALL solution allows you to quickly set role-based policy for mobile and laptop devices and users with a single rule across all objects; as a result, policy management can take only minutes instead of hours. A Mobile Connect user is granted access to the corporate network only after the user has been authenticated and mobile device integrity has been verified. End Point Control can determine whether an iOS device has been jailbroken or an Android device has been rooted, as well as whether a certificate is present or the OS version is current, and then reject or quarantine the connection as appropriate. iOS, Android, Chrome OS, Kindle and Windows mobile devices can connect to all allowed network resources, including web-based, client/server, serverbased, host-based and back-connect applications. Once a user and device are verified, Mobile Connect offers pre-configured bookmarks for oneclick access to corporate applications and resources for which the user and device has privileges. With Mobile Connect and Secure Mobile Access OS (versions 11.0 and above) for Secure Mobile Access 1000 Series appliances, prior to granting network access, if a mobile device has not previously registered with the SMA appliance, the user is presented with a device authorization policy for acceptance. The user must accept the terms of the policy to register the device and gain access to allowed corporate resources and data. The terms of the policy are customizable by the administrator. Mobile Connect in combination with Secure Mobile Access OS (versions 11.0 and above) for Secure Mobile Access 1000 Series appliances, enables administrators to establish and enforce policies to designate which apps on a mobile device can be granted VPN access to the network. This ensures that only authorised mobile business apps utilize VPN access. Mobile Connect is the only solution that requires no modification of mobile apps for per app VPN access. Any mobile app or secure container can be supported with no modifications, app wrapping or SDK development. Protect company data at rest on mobile devices. Authenticated users can securely browse and view allowed intranet file shares and files from within the Mobile Connect app. Administrators can establish and enforce mobile application management policy for the Mobile Connect app to control whether files viewed can be opened in other apps, copied to the clipboard, printed or cached securely within the Mobile Connect app. For iOS devices, this allows administrators to isolate business data from personal data stored on the device and reduces the risk of data loss. In addition, if the user’s credentials are revoked, content stored in the Mobile Connect app is locked and can no longer be accessed or viewed. URL control allows apps that require a VPN connection for business (including Safari) to create a VPN profile and automatically initiate or disconnect Mobile Connect on launch (requires compatible server firmware). In addition, for iOS or OS X devices, to simplify use when a secure connection is required, VPN on Demand automatically initiates a secure SSL VPN session when a user requests internal data, applications, websites or hosts. The SonicWALL solution supports easy integration with most back-end authentication systems, such as LDAP, Active Directory and Radius, so you can efficiently extend your preferred authentication practices to your mobile workers. For increased security, you can enable one-time password generation and easily integrate with two-factor authentication technologies. When deployed with a next-generation firewall, IT can easily define and enforce how application and bandwidth assets are used. 1 This feature is supported on the E-Class SRA/SMA 1000 series appliances only. Please refer to the product release notes for the specific software version required to support this feature. 2 This feature is supported on the SRA/SMA 100 series appliances only. 3 This feature is supported on the SRA/SMA 100 series and E-Class SRA/SMA 1000 series appliances only. Please refer to the product release notes for the specific software version required to support this feature. 4 This feature is supported on the SRA/SMA 100 series, E-Class SRA/SMA 1000 series and Next-Generation Firewall appliances. Please refer to the product release notes for the software specific version required to support this feature.